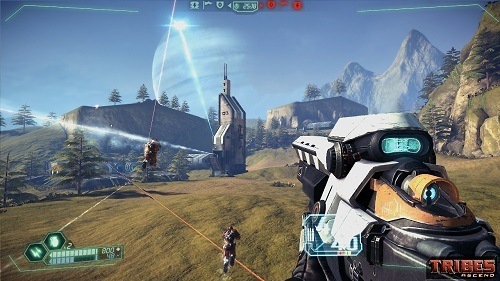 Tribes Ascend focuses on providing a fast paced and free to play first person shooter experience on Windows. The game also blends a futuristic setting with a deep class systems that provides plenty of depth to players. The core elements of Tribes Ascend that allow the game to be a fast pace experience is the jetpack and skiing system that allow players to easily move around the various game maps. 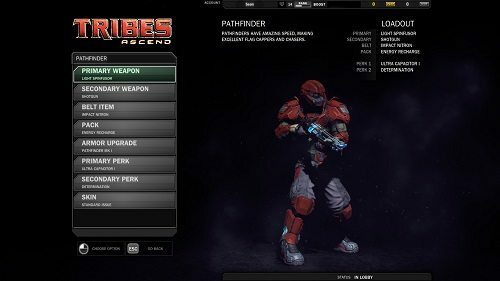 Like many modern day shooters Tribes Ascend gameplay is based around a class and loadout system that lets players heavily customise their fighter to suit their preferred style of play. Classes are fairly in depth with enough flexibility and options that each does feel unique. In terms of loadout options players can select two weapons and an extra belt item which can include explosives like grenades or mines. Players can also choose which armour type they want to equip which comes in three varieties (light, medium and heavy). The heavier the armour the more punishment a player can take but this comes at the cost of speed which can be a severe disadvantage in Tribes Ascend. Players don’t have access to all the games available loadouts and options from the start though and will need to unlock them by earning experience through play time. Beyond the standard first person shooter gameplay players can also use several vehicles on the battlefield which can help give your team an edge in enemy engagements. These battles take place across a good number of maps and game modes so you’ve always got plenty of different experiences available at any time. If you love your large scale first person shooter engagements Tribes Ascend could be the next FPS for you. Once you get used to the faster paced style of gameplay and controlling your skis you’ll wonder how you ever settled for any other game in the genre. A faster paced MMOFPS game. Good depth in classes and the loadout system. Small pool of vehicles adds more depth to the experience. Good range of map types and game modes. Free to play and supported with a good sized community.